The holiday season is fast approaching! There are so many things I love about the holidays; relaxing, spending time with loved ones, and eating foods I've eaten since I was a kid. But one inevitable part of the holidays that I don’t like? The stress! To help alleviate holiday stress, I came up with a few ideas to do with my family to help manage holiday stress and balance our bodies and minds. It's so important to take time with your family to just play! 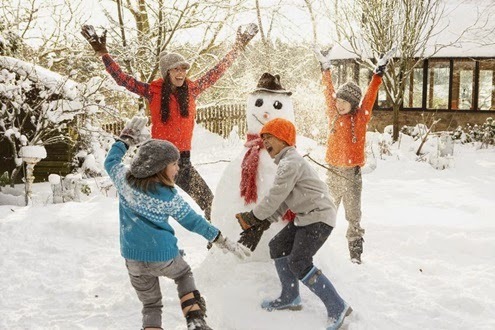 Whether you're building a snowman or playing a board game, the act of playing will help you manage holiday stress. Carve time out this holiday season for exercise. It's important to get out of the house and be active as exercise is one of the most powerful ways to reduce stress. Remember to breathe in fresh air and get your heartbeat up – activities with the family can be anything that get you moving! A walk outside, a family bike ride, or even a low-intensity workout like this flexibility and agility workout from Grokker Expert Angelo Dela Cruz. The holiday season is jam packed with spending time with the people you know and love. This can become a daunting task if you don’t take the time to reflect, collect your thoughts, and practice guided meditation. By spending some time on yourself, your experiences with your family come from a stronger place of self-clarity and self-certainty. And although meditation is largely about reconnecting with yourself, it can be done as family! Just gather in the living room, put on a guided meditation from davidji, and find your center. The holidays bring chock-full calendars of buffets, feasts, cocktails, and dessert trays. Often times I’m too focused on conversation to notice what I’m eating or drinking, and before I’ve realized it I’ve had healthy servings of, at minimum, 5 desserts! This holiday season be mindful of what and how much you eat. Don’t overload your plate, eat slowly, and enjoy every bite. And the most important thing to keep in mind is that your diet has a huge effect on your stress levels. So eat to be healthy both physically and mentally! Which Grokker video will you use to manage holiday stress first? Join Grokker for free today at grokker.com. Full disclosure: I (Olivia) am a compensated affiliate for Grokker. I became one because I joined Grokker and think it's awesome! I love the curated, high-quality content and saw so many videos I knew could benefit specific friends and clients. Plus, transforming myself from home totally fits my budget and schedule. It doesn't take the place of a live class (no hello hugs from friends, sadly) but it's a great option for times when my budget, schedule, or transportation options are restricted but I still want access to a high quality experience.